I had to post this as my first movie for Wuxia Cinema. 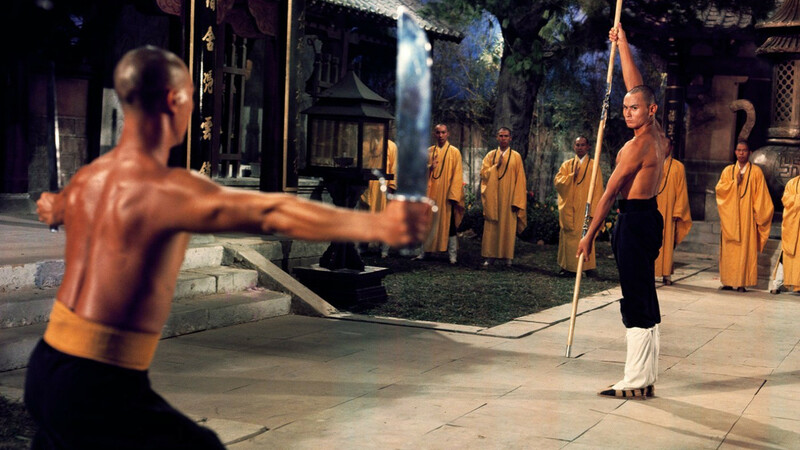 This was the first Kung Fu movie I had ever seen, I was only 13 years old and it was amazing! I just watched it again and I enjoyed it now just as much as I did all those years ago. My only regret is I’ve never been able to watch it in its original Cantonese. Only with that horrible English dubbing. However I have recently found out that there is now a 36th Chamber of Shaolin Trilogy Blu-ray Region All Hong Kong version that was released earlier this year. It contains The 36th Chamber of Shaolin (1978), Return of the 36th Chamber (1980) and Disciples of the 36th Chamber (1985) and includes special features. For me the best part is that it has the original Cantonese Audio track (as well as the original English dubbed) with English subtitles. It comes at a hefty price of US$79.99 (UK£52.76). Currently you can get Regions 0, 1 & 2 for DVD but only Blu-ray Region A/1 before this Hong Kong Trilogy Version was released. One of the reasons I like this film is that the training sequences are so essential to the film so it does away with the bog standard five minute training montage. Also I have always enjoyed the Kung Fu demonstrations during the opening credits of older Shaw Brothers films and this one is no exception. Chia-Hui Liu who is also known as Gordon Liu plays the character San Te who leaves his home to learn Shaolin Kung Fu so he may avenge his family who where murdered by the occupying Manchu army. This was Gordon Liu’s tenth film out of the 103 that he has currently been in. Younger generations may recognize him better as Johnny Mo in Kill Bill: Volume 1 (2003), the head general of the Crazy 88’s, and kung fu master Pai Mei in Kill Bill: Volume 2 (2004). I also like the fact that all the actors and stunt men had a real understanding of Martial Arts which I think is missing in many of todays Martial Arts Films and television shows. 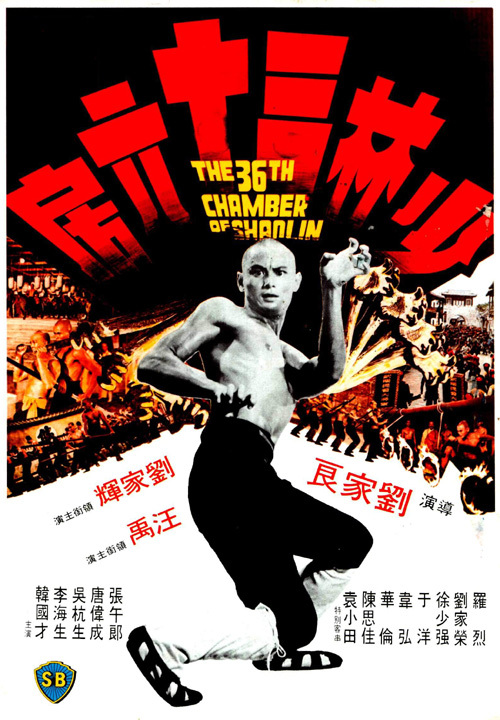 Gordon Liu studied Hung Gar from Lau Cham’s martial arts school. Lau Kar-wing was the fourth son of Lau Cham who himself studied under Lam Sai Wing, pupil of the legendary Chinese folk hero, Wong Fei Hung (this is according to wikipedia). I don’t know what else to say other than even after all these years and all of the amazing movies I have seen this is still one of the better Martial Arts films I have seen and even after watching it so many times I never get bored of it. This entry was posted in Martial Arts, Wuxia and tagged Aai Dung-Gwa, Chan Shen, Chan Sze-Kai, Chiang Nan, Gordon Liu, Gordon Liu Chia-Hui, Hao Li-Jen, Hon Kwok-Choi, Hung Gar, John Cheung Ng-Long, Keung Hon, Lau Kar-wing, Lee Hoi-sang, Lo Lieh, Lui Tat, Martial Arts, Peter Chan Lung, Shaolin, Shaw Brothers, Shum Lo, Simon Yuen Siu-Tin, Wa Lun, Wai Wang, Wang Han-Chen, Wilson Tong, Wilson Tong Wai-Shing, Wong Ching-ho, Woo Wang-Daat. Bookmark the permalink.